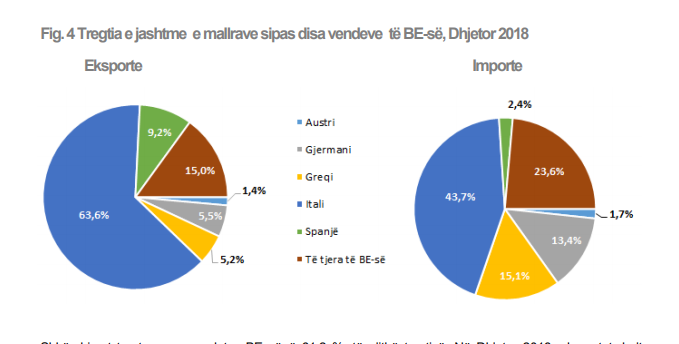 Total trade in Albania goods exported in 2018 was Lek 310 billion. This was a increase of 13.7 percent compared to 2017 the Albanian Institute of Statistics (INSTAT) confirmed on its December 2018 Foreign Trade report. According to the data provided in the report, Italy remains the main market where Albanian goods and commodities are exported. The total value of goods exported to Italy in 2018 was Euro 1.2 billion. This was two percent more compared to the previous year. The data confirm Italy as Albanians top export partner for 2018. Textile and footwear are the most important product exported to Italy. Almost 70 percent of the Albanian garment and footwear sector is re-exported to the Italian market. Yet, this sector is facing challenges as it cannot diversify and reduce dependence on the Italian market. Kosovo is the second country where Albanian goods were exported in 2018 with a total value of Lek 27 billion. This was 30 percent more compared to 2017. Kosovo mostly purchased iron and construction materials, and fuels. Experts say that Albania can substitute Serbia and provide the necessary goods for the Kosovan market. In the meantime, Spain keeps its third position but with a significant increase of 61 percent. The main product exported to Spain is oil. Spain is the top market of Bankers Petroleum. Textiles and footwear rank second among the goods exported to Spain due to Zara subcontractors in Albania. Germany ranks fourth with a total trade of Lek 13.4 billion or 24 percent increase compared to 2017. Albanian companies that manufacture wire and cables for the German market had an impact on the increased exports. Moreover, Greece ranks fifth with a total value of trade Lek 11.1 billion. An important increase was noticed in the exports to the United States and to Switzerland.